There are 25 articles in this month. Five years ago, Ken Smithmier found CrossFit. Then it found his hospital. Andréa Maria Cecil reports. 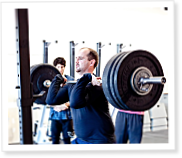 After 59-nine-year-old hospital CEO Ken Smithmier got hooked on CrossFit training, he traveled to Indianapolis, Ind., for a CrossFit Level 1 Certificate Course in April 2009. When he got back, he called a lunch meeting with the trainers involved in Decatur Memorial Hospital’s community wellness program. He told them about CrossFit. 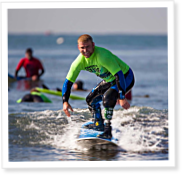 Operation Surf takes wounded members of the military into the ocean as part of its mission to rehabilitate with recreation. It was Sept. 25, 2008. Sgt. 1st Class Charlie C. McCall, a U.S. Military Police officer, was asleep beneath a tent surrounded by buildings in Kandahar, Afghanistan. One of his soldiers slept nearby. The rocket hit right between them. Rehabilitation of wounded soldiers often includes physical training, psychological therapy, medication and more—but it isn’t always enough. 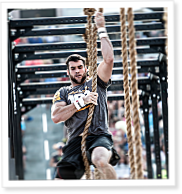 On Episode 326 of CrossFit Radio, host Justin Judkins interviewed two veteran CrossFit Games athletes who qualified for the Regional round of competition in 2014. Gary Helmick placed second in the Open in the Mid Atlantic Region, and Tommy Hackenbruck took first place in the South West. This episode was webcast on April 16, 2014. Polygamous members of Utah CrossFit affiliate explain their controversial views on plural marriages. One man’s sin is another man’s commandment. Though illegal, polygamy is still practiced in Utah, Arizona and other small pockets of the United States. Driven from the public eye, plural marriages are often the subject of scorn and always under legal suspicion. When the University of Nevada, Reno’s CrossFit affiliate first started running classes, eight people showed up. The next day, 16 people arrived. On the third day, 30. “We knew we were on to something. We also knew we were in trouble because we had to go spend more money,” explains Jim Fitzsimmons, director of campus recreation and wellness.